I received the same awesome bag we are giving away to one of you. All opinions shared are honest and solely my own. I love supporting others. I feel like at the end of the day my purpose on this Earth (other than being the best mom I can to JustaBXgirl) is to help people meet their purpose and help make connections where I can. You are not my competition because the only person I need to be better than is the person I was yesterday. When I find people that walk in the same sentiment it excites my heart because we live in a world where it seems people are always trying to one up the other. That makes me sad because there is enough room and resources for us all to win. That is what Mommy Bloggers Connect is about. Iveth, from For The Love To and Monica, from NYC Tech Mommy have come together to bring us a new blogging network and I feel blessed and honored to have been invited to their first event. These women are both supportive and sweethearts. Individually they rock and together they are a force ready to rock this blogging industry. For the inaugural event, Mommy Bloggers Connect brought together an array of parenting and lifestyle bloggers from the NYC and North Jersey area to meet, eat and network along side a few brands. They shared their vision of a blogger network that works for all those involved. I’m looking forward to being part of this network for a very long time. If you’re a mom and a blogger, even if you don’t consider yourself a mom blogger, I suggest joining this network and meet other mompreneurs that are making things happen. You can join Mommy Bloggers Connect HERE. 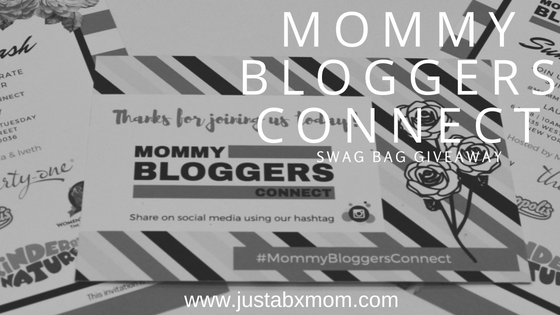 And thanks to the amazing women behind Mommy Bloggers Connect and the fabulous brands that they worked with on the first event you can enter to win one of the same swag bags we all received at the event! This is a Mommy Bloggers Connect summer essentials giveaway is for (1) Mesh Mix Cinch Bag Charcoal Crosshatch from Thirty-One, (1) Shark Cool Zip Snacker, and (1) Watermelon Cool Zip Snacker (total value of $55). This giveaway starts July 4th at 7AM EST and ends July 26th at midnight EST. Entrants must be USA residents and at least 18 years old. One winner will be randomly selected by rafflecopter.com from all qualifying entries and contacted via the email they provide. The email will come from ivethandmonica@gmail.com. The winner has 48 hours to respond or a new winner will be chosen. Good Luck! Use the Rafflecopter below to enter to win!